The club’s cyclo cross event is part of the Lestershire Cyclo Cross League, so our event will be a counting event towards this league, and for this year it will be the final event in the league. There are 5 races throughout the day, covering 12 age categories and for those who have not experienced Cyclo-Cross before it is a very exciting form of racing, requiring a mixture of speed, stamina and bike handling skills and is run on a compact mixed terrain course of between 1.5 – 2 miles. So unlike a road race you can see the riders for the majority of the course and they typically lap in 6-8 minutes. For local events you can ride on any bike, you’ll obviously need to have off-road tyres fitted to get some grip but there are no restrictions on the type of bike. MTB’s are more than welcome. It’s only when you go to National events that you need a specialised Cyclo-Cross bike. The races take account for all age categories from 8 years old upwards. So it is a great way to get kids started in cycling and teach them some great bike skills in a safe environment away from traffic. For this season the race will be being held on Sunday 30th Decemberand as before the event is being held at Cattows Farm, nr Heather. So you can find an event every weekend if you want within easy travelling distance. Sunday 29th December will see the final round of the Leicestershire Cyclo-Cross League at Cattows Farm, Nr Ibstock, again hosted by Coalville Wheelers CC. SAT NAV POST CODE – LE67 2TD. 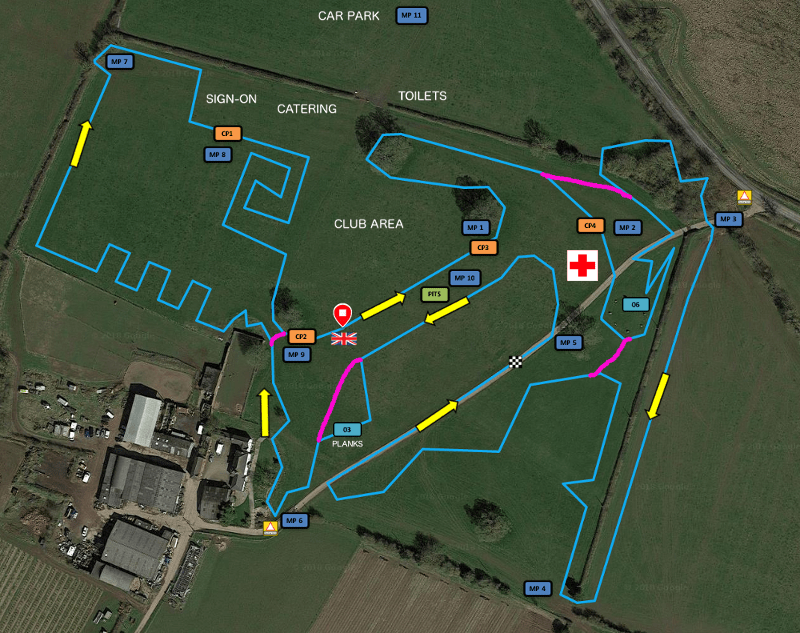 For those who have raced there before, the course will be familiar with a few interesting ‘twists’. The U12’s course is shown in Magenta. There is no warming up on the course whilst racing is in progress. Elements of the full course will be accessible whilst the U12 racing is taking place. Once again catering will be provided by PopTop Kitchen, serving a selection of hot and cold food, and in addition this year Café Allez will be providing great coffee to enjoy whilst watching some excellent racing. Former professional, Gary Coltman has kindly agreed to provide race commentary for this round. There will be a £2 charge for car parking, please bring change. Unfortunately we need to charge this to cover the hire of the venue and even with this charge we made a loss last year, but none the less decided to put an event on again this year. 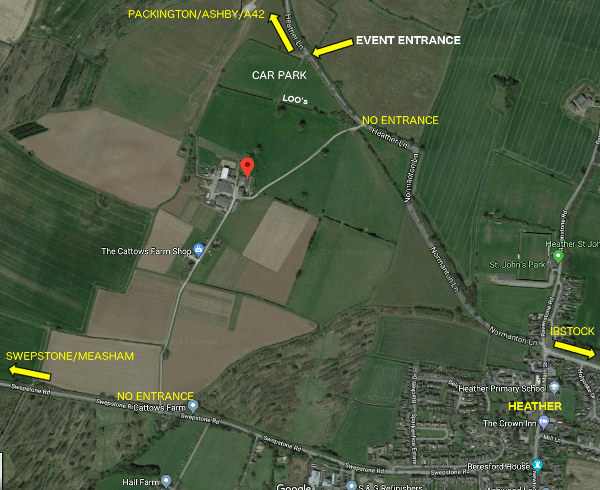 To find the car park, follow the Large Yellow signs from Ibstock and J12 of the M42. You can pre-enter for this event via the BC Website and entries are open for any rider, you don’t have to be a member of the LCXL League to ride! Sign on for each event will close 30 mins before the published start time. D3Racetec will be managing the chip timing. Please return the chip promptly after your race to the sign-on desk. In addition, for this round please remember to return your league race numbers. Have a safe journey to the race and we look forward to seeing you there.